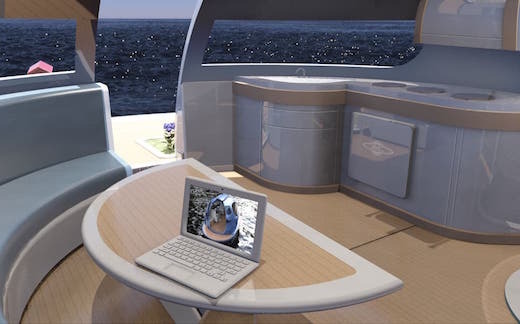 Italian Yacht-maker Jet Capsule has come up with a concept for a lovely floating home, which is fully self-sufficient. 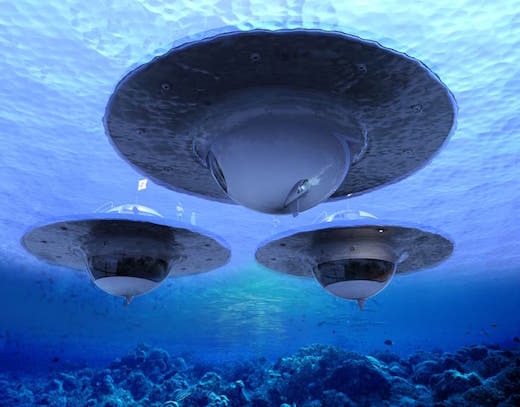 It’s shaped like a flying saucer, and they have named it UFO, which in this case stands for Unidentified Floating Object. The UFO is comprised of two half-sphere fiberglass shells, which form the two stories of this home. 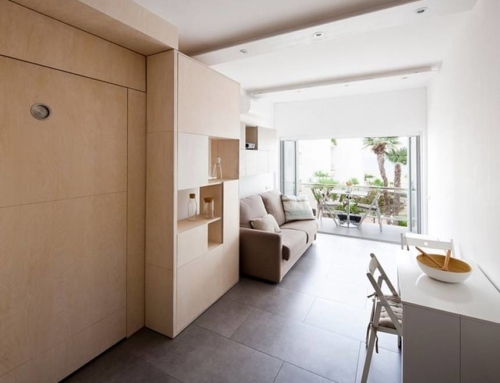 The design allows for flexible floor plans that can be customized according to the customers’ wishes. The basic configuration of the home would have a 215-sq ft (20-sq m) top level, which would feature a transformable kitchen and dining/living area. 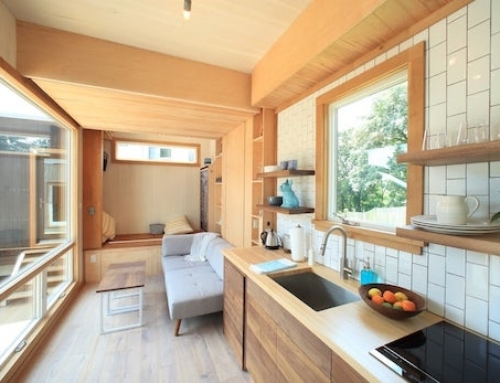 The lower level of the home measures 107-sq. 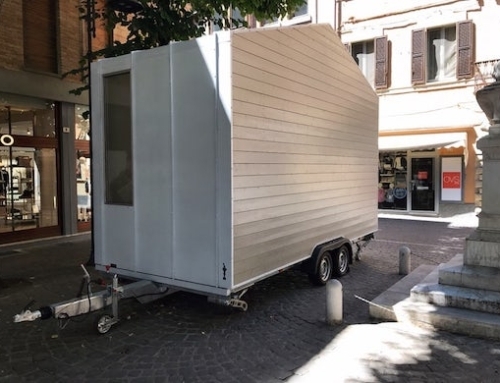 ft (10 sq m) and it would house the bathroom and bedroom. 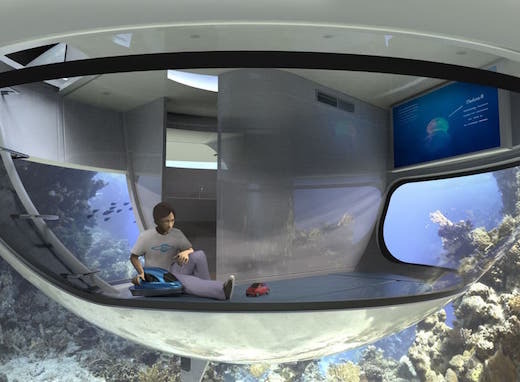 This level would be fully submerged, and the residents could view the sea life around them through the large windows installed here. Stairs would connect the upper and lower level of the home. 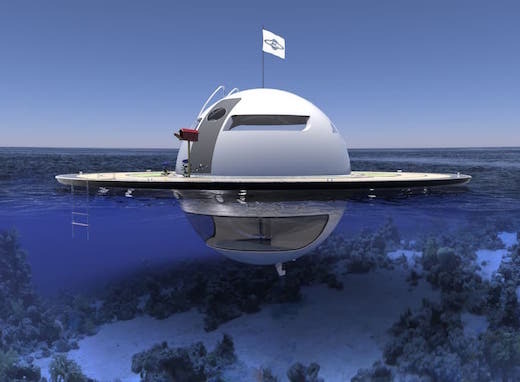 The designers say that the UFO is intended for “living in a floating house and moving slowly around the world.” The home is equipped with a water jet-propelled Torqeedo Deep Blue 1800 electric motor, which allows for a maximum speed of 3.5 knots (6.5 km/h, 4 mph). 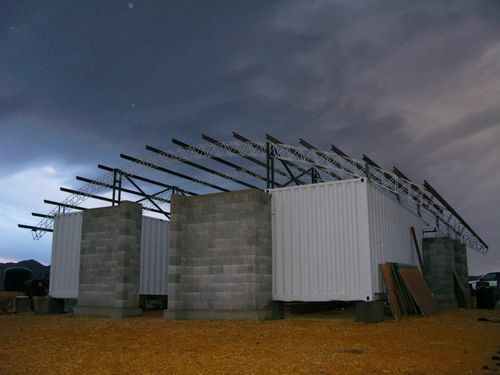 Energy is provided via a 430 sq. ft (40 sq. m) solar power array, which is located on top of the UFO in a closable lid. This is connected to a battery, which feeds the motor. 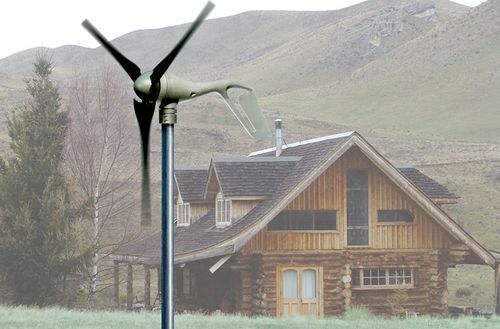 The home can also be fitted with optional wind and water turbines if the client prefers, which would also provide enough energy to run the home and motor. 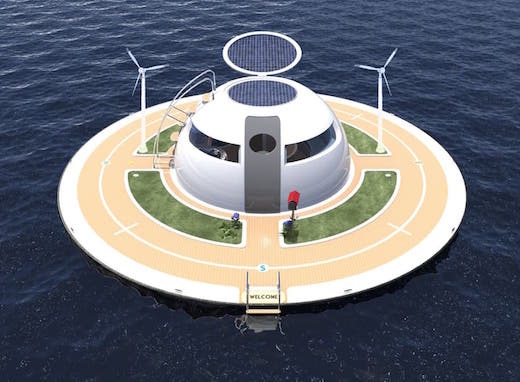 The UFO would also be fitted with an onboard water generator that would convert rain or seawater to fresh drinking water. 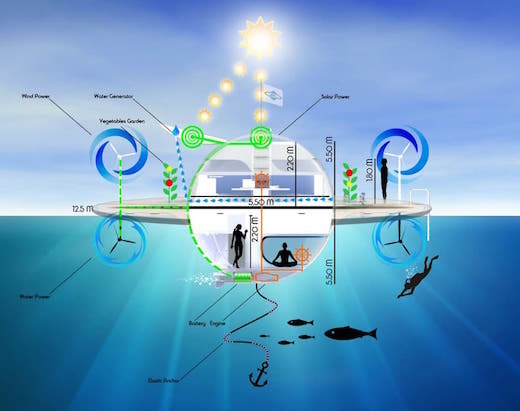 This water could also be used to water the vegetable garden that would be located on the UFO’s deck, which encircles the home and measures 41 ft (12.5 m) in diameter. 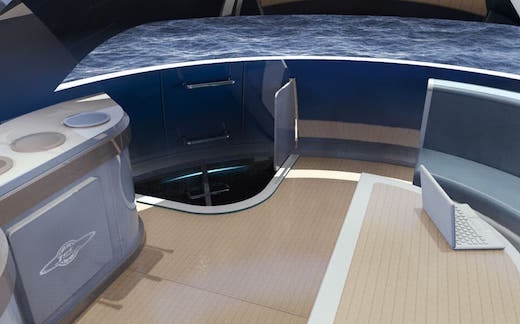 To keep it in place, the UFO would be fitted with a special elastic anchor system. 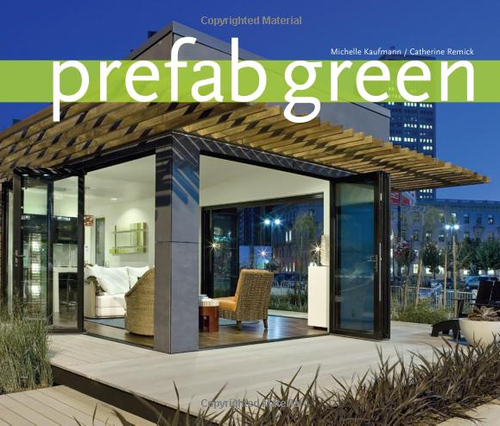 The designers are looking for investors at this stage, since they need around $800,000 to build the first prototype of this home. However, they estimate that the actual homes, once they become available, would cost no more than $200,000 to buy. Neat concept, but they need to make it bigger. 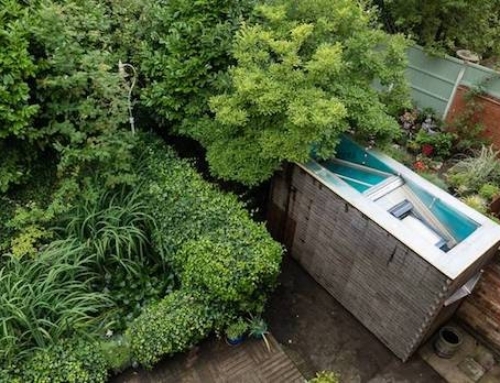 Add a 20ft insert in the middle (doesn’t really need to be round). 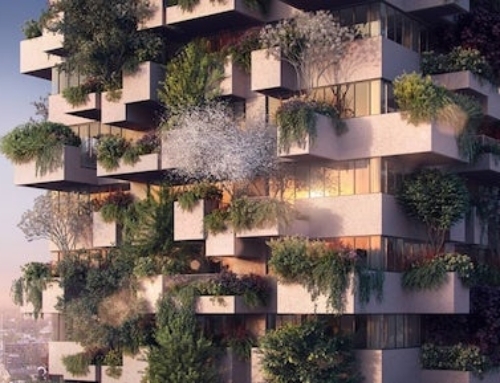 This would take it up to about 1000ft2 total, and would make it much more livable, and would probably only about double the cost.